What a fabulous day! Rosella and I woke up at 7:00 am and on the road by 8:00 am. She dropped me off via bus at the most central stop and gave me a great map to explore the city. We planned to meet up at 5:00 pm, along with Giuliana another online friend. My tour started with a cappuccino and apricot croissant, followed by a brisk walk to Porta Palzzo, where I picked up a great ITALIA sweat suit for a whopping 12 Euros. I then trekked to the citadel where there’s a labyrinth of tunnels underground. After all that work, I needed another cappuccino and a sandwich with parma ham and grilled vegetables. Once fortified, I headed over to the Museo Nazionale del Cinema. What a place! I rode the elevator to the top of the highest building in Torino, the view was specatular. The museum is a must! It is Italy’s version of Hollywood. Think La Dolce Vita and Felini’s 8 ½ alive in a 19th century masterpiece. WOW! Then, it was time for lunch. 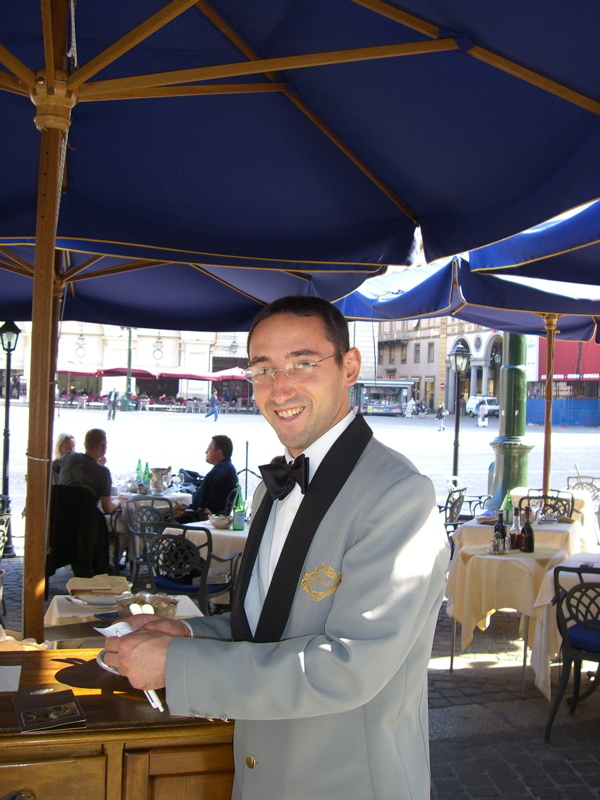 I went to Piazza San Carlo, where I dine at CafÃ© Torino. Yum oh! I love Italian food. I gobbled up a plate of pasta Bolognese and grilled vegetables in balsamic vinegar. Oh course I enjoyed some wine with my meal. I then did some window shopping on the way to the river Po. The walk is gorgeous, and I savored the warm weather that I have not felt since I left California. 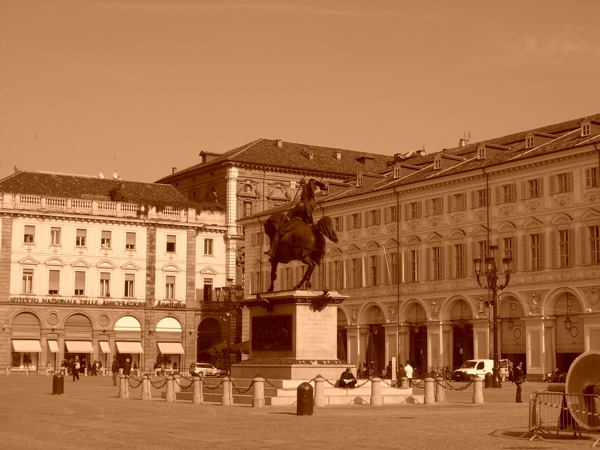 My walk took me past Verria Reale, the crown jewel of Torino. It is the place that the palace of Versailles was copied from. By then, it was already 4:30 and I had to get back to the train station to meet Rosella. I left my jacket and new sweat suit at the information center in the heart of Torino. It was used mainly for the Olympic, but the city decided to keep it (good choice!). They offer free locker space for the day, so I locked up my clothes that morning and took the key. We then ended up at Rosella’s house drinking limoncello and eating fresh fruit. The day was superb and now I have two new friends in Torino!